- Sending mailings, newsletters, promotions or invitations? 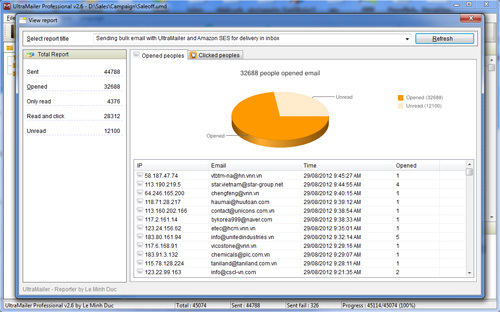 - UltraMailer is the best e-mail marketing software for managing your mailing list. - Discover the free solution or the cost effective one, a one-time payment package which allows you to easily manage your email marketing using a desktop software. UltraMailer have an intuitive interface, it's can manage your mailing list and seperate by category, you can also manage your composed email so easy, reload state of a composed email lighting speed with one click. 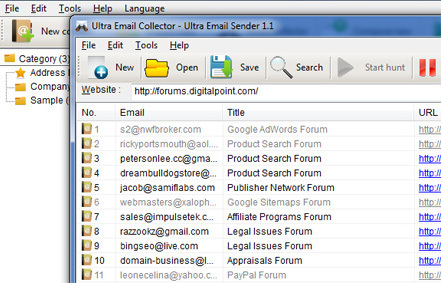 Collecting email with built-in "Ultra Email Harvester"
Acquiring your potential customers e-mail addresses is a cornerstone of successful e-marketing. UltraMaier provide a built-in innovative tool allows extracting e-mail addresses from your target-audience relevant websites! UltraMailer provide 323 professional HTML Email Template for choosing, the special great is all templates have been tested vigorously in all major email clients. 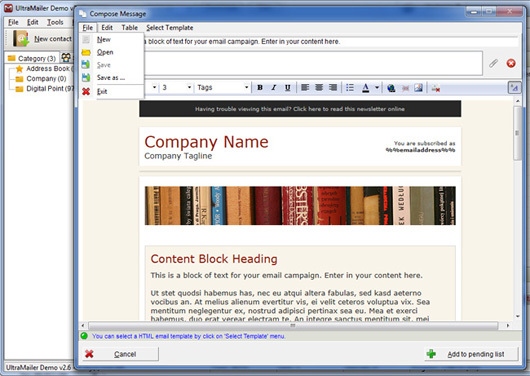 That mean you will never scare if a template look terrible when view in different email client like Gmail, Yahoo, Hotmail or Outlook cause by their display rule. Unlike other software, this is a built-in function and life-time using. You won't need a recurring fee for the tracking service like other software. That why UltraMailer stilling the best ! Download UltraMailer now to experience the wonderful features of UltraMailer !